Stepping into the historic Russ Building complete with granite floors and marble wainscoting, I thought what a great place to host an OWA event. Members were given a peek at an architectural jewel for our meeting about preparing living trusts. Nancy Jarvis, Senior Partner at Farrand Cooper, PC, began her lecture to a full house squeezed around the firm's. conference table and Florence Knoll vintage chairs. Nancy delved into the difference between Wills and Revocable Living Trusts. Taking note of demographics of the audience, she assured the group that what she had to say was applicable to all ages, though especially to those with children. Out of the entire night the main points that I took home with me are listed below. There are three things that Nancy suggested that all of us should prepare for the future. 1. A Will by definition only becomes effective after death, not if you are incapacitated. After death, all of one's property proceedings carry into the court and become public information. The public has access to the names of the beneficiaries as well as the various properties listed in the will. The court administration of property after death is known as probate, which can easily last a year or two. Besides being a long and expensive process, the frustration probate brings can taint the grieving period as loved ones try to reconcile the deceased's wishes. Nancy recommends setting up a Will that states that you have a Revocable Living Trust; thus transferring the entire process to the Revocable Living Trust. 2. A Revocable Living Trust is the management and distribution of your property upon your death or incapacitation. A Revocable Living Trust, like a Will, can be modified or eliminated at any time by you, the trustor or grantor, as long as you are competent. A Revocable Living Trust enables you to avoid the time and money associated with a Will in probate by letting you appoint a trustee to manage your Living Trust. Since a Trust is a private document, it is not filed in public documents like Wills and therefore escapes public access. This circumvents probate because when a Revocable Living Trust is set up assets are collected and transferred to the appointed trustee before death. Nancy stated the importance of listing alternative trustees in case the appointed trustee is unavailable. In the case that both a Will and Trust exist with separate instructions, the Trust takes precedence over the will. A benefit of Revocable Living Trusts is that they allow married persons to retain separate property even after accruing community property during marriage. Upon death, current law requires that a notice be sent out to all beneficiaries advising them to obtain a copy of your living trust. 3. An Advance Health Care Directive is a very important document to set up. The California Advance Health Care Directive is a document that instructs others about medical care if you are unable to make decisions on your own. It also allows you to name an agent that will handle health care decisions upon your incapacitation. Unlike the Natural Death Act Declarations and Durable Powers of Attorney for Health Care, the Advance Health Care Directive does not expire. FYI, if you have a Durable Powers of Attorney for Health Care from before 1992: IT HAS EXPIRED! You need to replace it as soon as possible. The Advance Health Care Directive can be set up for anyone 18 years or older of sound mind and acting of their one free will. It does not expire unless you revoke it or include a specific expiration date in the directive. Nancy recommends that instead of having witnesses sign this form, simply get the papers notarized for a nominal fee. One important reminder that Nancy impressed upon the group is to revisit the Will, Revocable Living Trust, and Advance Health Care directive every so often to ensure that these documents reflect your current wishes. A few stories from the OWA membership that were shared underscored that making a Will, a Revocable Living Trust, and/or an Advance Health Care Directive once and forgetting about it can result in unintended consequences. The event could have easily surpassed two hours. Questions stemming from personal experiences and curiosity filled the room. Expertly and clearly, Nancy answered each question. Only after limiting the questions did the first 2007 OWA event come to an end. Equipped with the knowledge of the documents to complete, members had a new appreciation of the process and the expected results from preparing the necessary paperwork in advance. We also found out what happens when those documents are left to wishful thinking or bad advise. So please take the time to make the necessary arrangements with an Estate Planner for the benefit of your family and friends. Lastly, while it may be awkward to discuss these items with your family it is extremely important to do so and be sure to keep copies of the paperwork in safe places. Little did I know what venue treat was in store as I arrived in San Francisco for OWA's February 13th Estate Planning program. Nancy Jarvis provided an illuminating talk and answered many of our questions in her Russ Building office. The Russ Building is an office structure with an entry reminiscent of a cathedral, a building with operable windows, and a marvelous place with origins in another era. Built in the roaring 20's, it was billed as the West's largest office building. It is 335,245 square feet and housed 1,370 offices. It is 435 feet tall (divided into 31 stories) and typically served 3,500 "inhabitants" in the 1930's. Construction started in 1926 and completed on September 1, 1927, five months ahead of schedule. (Don't you wish this would happen to your projects?) It had many of the latest features such as 16 elevators, the capacity to park 400 cars in its garage, and in the sub basement a 20-ton refrigeration plant to supply filtered, sterilized, chilled drinking water to each room (in addition to the usual hot and cold water service). Our speaker, Nancy Jarvis, kindly provided me with a reprint of the 1933 publicity brochure compiled by D'Evelin & Wadsworth, Inc. the advertising agents for the Russ Building Company. It is interesting for what it says about the building and the society at the time and for what it does not say. Nowhere is the architect mentioned. The brochure is squarely aimed at "business men". Note was taken of steam baths and showers available so, "returning from train or motor trip direct to his office- or staying downtown for dinner, the Russ building tenant can thus spend an invigorating quarter-hour and emerge with new zest for the work ahead". There is even a description of the Women's Rest Room as, "attractively furnished to afford a homey atmosphere." The brochure noted a matron staffed the Women's Rest Room in order to be available to, "care for women in the building in emergencies". Some of the building's touted attributes would be right in step with current design thinking. Abundant light, of the natural variety, was a big selling feature. The building had a "service floor", the 11th, where shops catering to tenants were located: drug store, barber shop, branch library focusing on business volumes, coffee shop, conditioning club (what would be called a fitness club today), valet, and haberdashery. The garage offered washing, fueling and renewal of license plate services for tenants. On three of the floors large office suites complete with common reception and phone answering services provided small individual offices with all the advantages of the "best building in town" but not with the added expense of private services. While the Russ Building has evolved over the decades it still fulfills it's original function: it is an office building . Today the ADA rest rooms, self-service elevators, the operable windows, high ceilings, day lighting and original ornamentation are prized by tenants both business men and business women alike. Design of the Conservatory of Music's new home at 50 Oak Street, San Francisco speaks to the Conservatory's vision: preserving music of the past while exploring boundaries of new music. Combining historic and contemporary architecture, while achieving superlative acoustics, is a balance of science and grace that requires the harmonious interplay of design, engineering, and construction. The new interior construction for this facility was designed by SMWM with the utmost care, in collaboration with world-renowned acoustician, Kirkegaard Associates, to insure superlative acoustical performance. All spaces, from the smallest practice room, to the main concert hall, are built with massive walls for isolation and responsiveness. Variable acoustic systems were also integrated in performance spaces to guarantee varying requirements of differing musical styles and intensities could be accommodated elegantly. Preservation of William Shea's 1914 50 Oak Street faÃ§ade and the grand ballroom, while removing the rest of the building, required a complex structural solution that in its execution is analogous to separating Siamese twins. All existing columns were shored and supported while a new foundation was built to compensate for the site's marshy soil. The ballroom now hangs in place from transfer trusses at the roof level. A concrete moment frame that is part of the new building supports the 50 Oak Street faÃ§ade. The Conservatory's new home is 126,000 sf and eight stories tall. It accommodates three performance spaces, a 450-seat Concert Hall, a 140-seat Recital Hall, and a 100-seat Salon, in addition to a complex assortment of classrooms, teaching studios, and practice spaces. 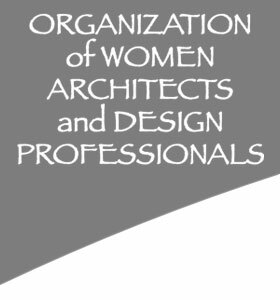 On April 10th, Liza Pannozzo, AIA, LEED AP, will be discussing the design and construction of this unique building and leading our tour. She is a Senior Associate at SMWM. 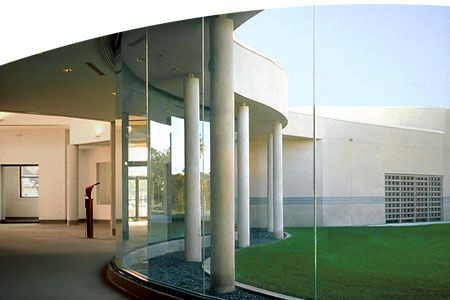 Ms. Pannozzo is an architect with 15 years of experience in the design of projects for academic and civic institutions. An expert in the design and technical coordination of diverse academic projects ranging from classroom buildings to athletic and theatrical facilities, Ms. Pannozzo has worked on some of the firm's most significant educational projects in San Francisco. She has been the project architect for a recent classroom addition to the Urban School, the Drew College Preparatory School, and Lick Wilmerding's Library, Arts + Humanities Center. Ms. Pannozzo's approach to the design for the new Conservatory of Music was motivated in part by the idea of celebrating historical architecture in the context of contemporary design, a recurring theme in much of the firm's work. Karla Avila, Communications Coordinator at the San Francisco Conservatory of Music will also be on hand at our April tour to answer questions about the Conservatory's programs. For your information, we received a proposal from the Mediator for the Health Net affair to settle our case, continuing the plan under the same terms as we have had from the beginning. I have signed this agreement. As Murphy's Law would have it, Health Net has just changed one of its lawyer representatives so there will be a delay until Health Net looks at it. So they could reject it, or alter it, but even receiving a proposal is progress. Under this proposal, the rates will go up to market rate since they have been frozen since the affair began. The rates are to be those of a guaranteed Association with the same risk factor that we had before, which is what we would want. But rates have continued to go up strongly since the injunction went into effect. So there will be some sticker shock if the proposal is accepted by Health Net and the new rates go into affect.This could be as soon as April 1 but that assumed that Health Net would deal with the proposal promptly, which doesn't appear likely. Anyway, I consider this positive progress. We heard this morning from our attorney that Health Net has accepted the mediation agreement and that OWA's group will be back to normal. The paper work will take about a month to complete, but the attorney thought that Health Net may have been in touch with our agent about starting the current premiums as of May 1, so brace yourself. Our premiums have been frozen for something like three years so the increases to current rates will be steep. According to the agreement, our group has maintained its rating as having a median claim history and is paying median rates, but that doesn't avoid a sharp increase. We will let you know the new rates as soon as possible. Kudos to Janet Crane for her efforts and her success! Margaret R. Goglia, AIA was recently appointed to the Town of Moraga Planning Commission. Kristina L.W. Raupach, AIA, CSI, CCCA, joined Wiss, Janney, Elstner Associates, Inc. as a Senior Associate in August of 2006. 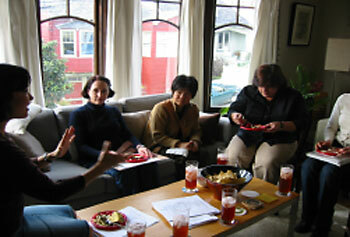 Kristina serves on the East Bay AIA Codes Committee as well as the City of Albany Green Task Force. 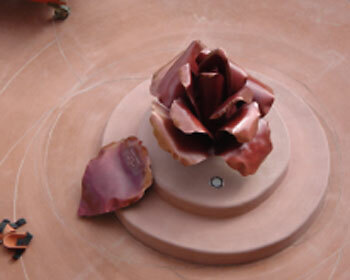 Keiko Nelson, recently installed a bronze sculpture titled, "Rosebud" at the Village Crossing in San Bruno, CA. Our next tour is sure to be a sell out. We have a limited number of spaces available for the SF Conservatory of Music Tour. Please reserve your space by emailing OWA Information. One space per email address, please.